When you have software like Ice Cream Sandwich ahead of you and it will be ridiculous for anyone to maintain relationship with Éclair or Froyo type stuffs. 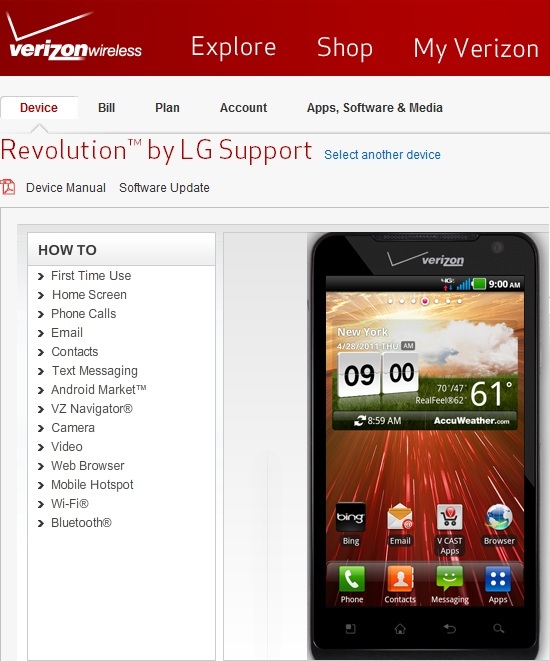 And LG is not trying to do that anymore with Verizon branded Revolution. They just released the Android 2.3 Gingerbread update for Revolution from yesterday. It is a 90MB of download and it will make your system software VS910VZ7. Check this Verizon support link for details. Along with the normal Gingerbread stuff, LG's got a few device-specific improvements and bug fixes. If you were having trouble getting a picture over its HDMI-out, this new software addresses some problems with the port. Turning on and off different connectivity options should now function properly when using Airplane mode and a menu-related crash situation has been fixed. You should also look for several changes to messaging and email, like gaining the ability to save texts to your LTE SIM. With email, attachments should now properly indicate their size, folders will now be in the correct order, and you'll be able to set an out-of-office status without needing to specify a time period.